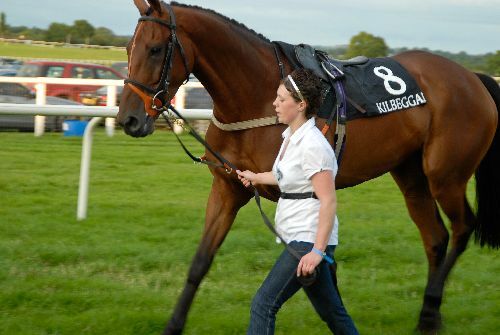 An evening of fun at Kilbeggan Races is one of the most enjoyable experiences. It mingles the heart stopping spectacle of racing over jumps with the laid back charm of a genuine rural meeting. The Kilbeggan formula is made for fun, friendship and atmosphere for the thousands who return meeting after meeting giving Kilbeggan the edge over other events. On the 9th of March 1840 a group of gentlemen organised a race in Kilbeggan for a Challenge Cup valued at 40 guineas with 10 pounds added by the Stewards. Between 1840 and 1855 racing was held in several locations around the town including the present site. It was revived in 1879 when the first official meeting was held at Ballard on 17th April in a field provided by the Locke family, owners of the distillery which is still in operation in Kilbeggan, and racing continued there until 1885. In 1901 the races were revived again at the present location in Loughnagore and have been held every year since except for the period 1941-45. The quiet midlands town is transformed on race evenings into a festival of social and sporting pleasure, drawing admirers from every corner of Ireland. You can meet friends, circulate freely; you can eat, drink or cheer without restriction; you can bring the family or whoever; where for a few pounds the odds are much better than a lottery ticket; and where you can boast afterwards that it was sheer skill that made you pick the winner! If you are bright, witty and rich you will enjoy Kilbeggan Races and if you are not, you will enjoy it just the same.